Hot off the press...Arch Crown’s 48-page catalog features over 100 styles of stock, pre-printed and custom printed tags and labels, plus a full-line of bar code technology products. Ask about our new TT385 computer tags for earrings and earring cards. Now available for plastic and parchment string tags, optional gold and white elastic and clear monofilament strings. Poly-Lam thermal transfer computer string and barbell style tags are stronger than polyester and Kimdura® and provide superior print quality... text and bar code images will not rub off. TT306C Clear-Tail tags with clear adhesive-free loops are available in gold, silver and white. Arch Crown’s bar code packages includes everything you need to print and scan bar code tags using your own computer. DataTagger and BarTender® label design software for Windows® offers benefits of thermal transfer printing to businesses that currently do not have bar code printing capability. Durable plastic molded relief tags say ‘exceptional quality’ about the jewelry on which they’re attached. Avoid unnecessary returns with tamper-resistant, Secure-Lock ‘Not Returnable If Removed’ molded tags. They are ideal for internet sales. Once closed, the tag cannot be re-opened unless the cord is cut, helping to minimize unauthorized returns. Molded tags are available in custom and pre-printed styles. They pay for themselves with one saved return. Arch Crown makes your marketing efforts more attractive before, during and after the sale with custom tags and labels. It’s easy to let the recipient know where the gift came from. 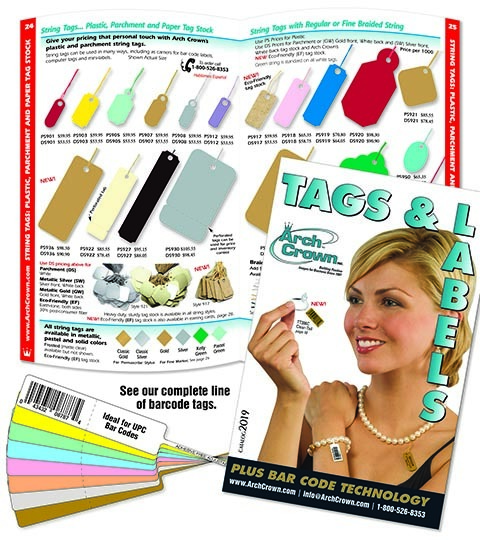 Arch Crown tags and labels are the professional way to price and promote jewelry, gifts and accessories. Free tech support is available from authorized factory trained technicians. For free samples and new catalog, call 1-800-526-8353 or visit: www.ArchCrown.com.